Eighteen months after agreeing to formally continue to take a stand in the face of climate change, the Metropolitan Water Reclamation District of Greater Chicago (MWRD) is fulfilling its commitment to reduce greenhouse gas emissions. The MWRD has decreased greenhouse gas emissions by 30.5 percent relative to 2005 levels, and projections show that after the addition of new infrastructure, those emission levels will potentially decrease to approximately 50 percent. 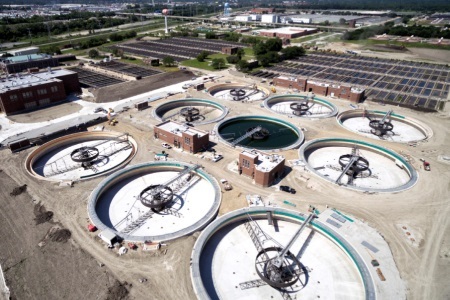 The MWRD in late 2018 installed a new primary treatment and grit removal system that will soon replace aging Imhoff tanks at the Stickney Water Reclamation Plant (WRP). These upgrades position the MWRD to curb methane emissions and reduce its carbon footprint by up to 172,000 metric tons of carbon dioxide equivalents. These reductions support the United States’ pledge to lower greenhouse gas emissions by 28 percent below its 2005 level by 2025, according to the Paris Climate Agreement. Despite the federal government’s intention to withdraw from the Paris Agreement in June 2017, the MWRD Board of Commissioners passed a resolution a month later in 2017 to honor the Paris Agreement by continuing to reduce greenhouse gas emissions. Knowing that climate change could adversely impact the residents of Cook County and the MWRD’s operations through increased precipitation and flooding, the MWRD Board of Commissioners decided the cause was too crucial to renounce. Staff sought ways to mitigate the risk of climate change ahead of the 2025 deadline. “It is critically important for us to examine potential sources of renewable energy, find ways to reduce our carbon footprint, and recover valuable raw materials as we work toward a goal of addressing climate change and improving our water environment,” said MWRD President Kari K. Steele. The MWRD operates seven WRPs and 22 pumping stations, consuming approximately 600 million kilowatt hours per year of electricity. To address climate change, the MWRD’s Strategic Business Plan identified various ways to protect the environment, reflecting the MWRD’s diversity of important tasks and mission. These goals included reducing both greenhouse gas emissions and energy consumption; recovering resources; promoting resiliency; flood protection; greater use of both green and gray infrastructure; and encouraging greater use of recycling and reuse. The MWRD has met many of these goals both directly and indirectly. Thanks to ComEd’s alternative energy sources supplying part of the MWRD’s power needs, the agency’s carbon footprint from electrical usage dropped by more than 50,000 metric tons of carbon dioxide equivalents since 2005. More directly, by decommissioning 36 older Imhoff tanks at Stickney WRP, the MWRD lowered biochemical oxygen demand settling and capture and drastically reduced methane escaping to the atmosphere. There will be 72 additional tanks replaced by the new preliminary and primary treatment facilities. The MWRD constructed nine 160-foot diameter primary settling tanks and six 132-foot long aerated grit tanks, associated support facilities, service tunnels and conduits, which are expected to have a lower carbon footprint impact than the Imhoff tanks. In addition to promoting sustainable energy practices, these new facilities will increase and improve grit removal, protect downstream piping and equipment and alleviate odor issues associated with the wastewater treatment process. The MWRD is also generating less nitrous oxide from discharge to the waterways, which is likely attributed to biological phosphorus removal at the WRPs. The MWRD also sequesters carbon through different channels. The MWRD’s beneficial reuse of biosolids as a soil amendment has yielded a savings of more than 17,000 metric tons of carbon dioxide through biosolids land application for crops. MWRD trees have also sequestered nearly 5,000 metric tons of carbon dioxide, not including the MWRD’s “Restore the Canopy” program, which has dispatched more than 56,000 oak tree saplings for the benefit of soaking up stormwater, sequestering carbon and improving air quality. Other forms of green infrastructure implemented by the MWRD across Cook County have allowed new vegetation to sequester carbon and also decrease the energy needed to convey and treat water when it is absorbed naturally into the ground. These projects also reduce the heat island effect in local communities by replacing asphalt with natural landscaping that can indirectly reduce energy consumption. “By meeting greenhouse gas emission goals well ahead of the Paris Agreement goals for 2025, the MWRD is leading the fight to save our planet while making Cook County a quality place to live,” said Kimberly DuBuclet, chairman of the Federal Legislation Committee. At the 21st Conference of the Parties of the United Nations Framework Convention on Climate Change in 2015, representatives from 195 countries adopted the Paris Climate Agreement to limit global temperature increases to no more than 1.5º Celsius above pre-industrial levels. The Intergovernmental Panel on Climate Change has found that atmospheric concentrations of the greenhouse gases carbon dioxide, methane, and nitrous oxide have exceeded pre-industrial levels by nearly 40 percent, 150 percent, and 20 percent, respectively. Higher concentrations of greenhouse gases allow the atmosphere to trap more heat, increasing global temperatures and contributing to extreme or unusual weather events, including the flash flooding that has become a focus of the MWRD in its endeavors to protect local communities. In December 2018, nearly 23,000 delegates met in Katowice, Poland to devise a plan to meet carbon reduction goals in recognition of the IPCC and pact outlined in Paris. COP24, as it is known, represented the 24th Conference of the Parties to the United Nations Framework Convention on Climate Change and offered countries guidance and direction into implementing Paris Agreement initiatives. Additionally, Illinois Gov. J.B. Pritzker signed an executive order on Jan. 23, 2019, committing Illinois to the United States Climate Alliance to pledge that the state will meet the Paris Agreement goals of reducing greenhouse gas emissions by 26 to 28 percent by 2025 compared to 2005 levels.